Hotel K+K Palais, Vienna. K+K Palais Hotel Vienna. A unique historical Viennese hotel captures the spirit of history and Viennese charm. The exterior imperial architecture contrasts stunningly with the elegant, modern interiors. All who visit this hotel gladly return. 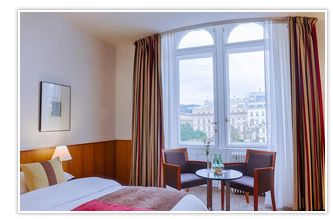 K + K Palais Hotel is truly centrally located: in Vienna's 1st district with its sights, theatres and shopping boulevards. Vienna's most famous landmark, St. Stephan's Cathedral, is just a few minutes from the hotel on foot. Explore Vienna's city centre at your own pace and visit other districts via the convenient underground U-Bahn trains. The modern Bistro Lounge offers a fine selection of dishes for lunch and dinner. Two Internet terminals are located in the Lobby for use free of charge. The hotel's business lounge is fully equipped to make your business pleasant. The hotel's common areas are equipped with wireless LAN and the internet corner in the lobby offers PC workstations with free access. Public parking is available nearby. The hotel offers room service, and laundry service. The reception team at K+K Palais Hotel can arrange tickets and reservations for any event or activity.